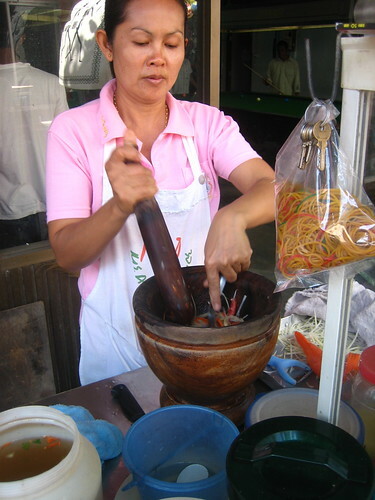 All over Thailand at this very moment, men and women stand before deep bowls, a spoon in one hand and a wooden pestle in the other, deftly pounding and stirring, pounding and stirring, mixing up what has become one of my favorite dishes of all time: som tam. 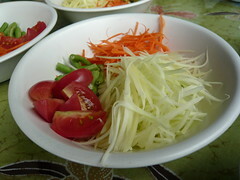 Som tam, or spicy green papaya salad, is ubiquitous in Thailand. I first had it on a street corner in Bangkok, and it was a sweet, sour, salty, spicy and utterly delicious wake-up call for my taste buds. I fell in love with the dish there and then, and for the rest of our time in Thailand, Jeremy and I sampled as many som tams as we could, from rooftop restaurants to street vendors (the street vendors were invariably the best). Much of our time in Thailand was spent on the island of Koh Tao, where we were lucky enough to take part in a Thai cooking class at Charm Churee resort. 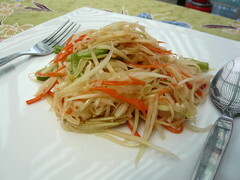 Som tam was one of the dishes we made, and I now use the Charm Churee recipe to make som tam at home. This isn’t the canonical recipe for som tam; different recipes call for adding the ingredients in a different order, and most recipes include dried shrimps, which this one doesn’t. But som tam is a very customizable dish, so feel free to add dried shrimp, leave out the peanuts, use more chilies, use less sugar—make it the way you like it. 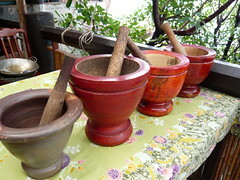 Pound the garlic and chilies to a paste with a mortar and pestle. Add the beans and pound them lightly to bruise them, then add the papaya and carrot. Pound and stir so that the vegetables are slightly softened (not ground into mush!) so that they soak up the chili and garlic. Add the lime juice, fish sauce and sugar, pound lightly and stir, and check the taste, making sure you have a good balance of sweet, salty, sour and hot. Adjust the seasoning if you want to, then stir in the tomatoes, bruising them lightly so they meld with the other ingredients. Pile the salad in a bowl or on a plate, sprinkle over the chopped peanuts and you’re good to go. In Thailand, this is often served as part of a set with sticky rice and grilled meat, but it makes a great snack or lunch all on its own. And while nothing can compare to eating searingly hot som tam out of a plastic bag on a sweltering afternoon in Thailand, it’s incredibly delicious even when consumed sedately at a dining room table in England. 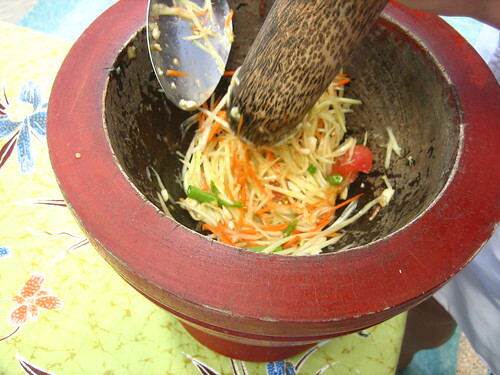 A note on equipment and ingredients: The ideal way to make this is with a big Thai mortar and pestle; they’re widely available online if you can’t find one locally (my search for a mortar and pestle is what took me to Unithai for the first time). But if all else fails, you could use a big bowl and a something like a wooden spoon to pound the vegetables. I julienne the papaya with a little peeler gadget we bought on the street in Bangkok. I’ve seen them here in Asian shops, and they’re dead cheap. If the peeler is too much of a hassle, you could grate the papaya on the large holes of a cheese grater. 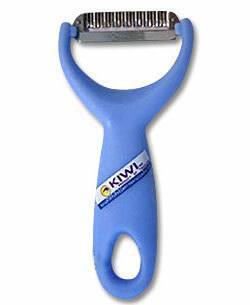 Or if the peeler is too much of a cop out, you could use a big knife like the pros. All of the ingredients should be available from a well-stocked Asian food store, though admittedly the green papaya can be tricky to come by. The Internet will give you plenty of suggestions for green papaya substitutes, but I can’t vouch for them. Some easier substitutions are green beans instead of long beans, light brown sugar instead of palm sugar, and cashews instead of peanuts. But I wouldn’t go messing with the lime juice or the fish sauce; these are two of the quintessential flavors of Thailand, and without their tang and pungency, som tam just isn’t som tam. 1) Common ripe fruit papaya, usually no more than 6 inches long & 4 inches in diameter. Most common in stores in the US & Britain. Great green as it still has a papaya taste, but is somewhat hard to find in Ireland & Britain in the market green. 2) Mexican papaya, aka the Big Honkin’ Papaya. 12-16 inches long, 8-10 inches in diameter. Can be overly sweet & moldy. Very hard to find green. 3) Asian Papaya, usually looks like a big Mexican papaya & a cucumber had a baby, 10-14 inches long, 2-5 inches inches in diameter. This is the one that is usually used in Thailand, but the ones I bought at the Asian stores in Dublin were too green and had no flavor at all. Thus, if you are in Europa, my recommendation is to buy one Asian and one regular fruit green papaya if you can find it green, and shred both, follow recipe. If you are in SoCal or the US Southwest, it is easy at the regular supermarket & the Asian supermarkets to get good Asian and green fruit papayas. Still say no to the Big Honkin’ papayas due to sweetness and mold on the outside, as they are usually way riper than they look & feel. I prefer my som tam with the little dried shrimp as they add a nice salty, hard, briney, bizarre kick to the proceedings.